We are experiencing a sublime Spring in the NSW Central Tablelands this year. There have been some excitingly plentiful rainfalls: gardens are luxuriant with blossom, lawns are green, and trees are putting on rapid growth. Roses, which grow exceedingly well in this area, are producing exuberantly: voluminous beauties floating over garden walls, arresting the walker in her tracks and ensuring a moment of admiration and reverence. Some strange anomaly has meant that my roses aren't quite out yet, which is a Good Thing as it gives me time to admire the Leptospermums in my garden which are flowering in stellar fashion, and which deserve a post to themselves, in my opinion. 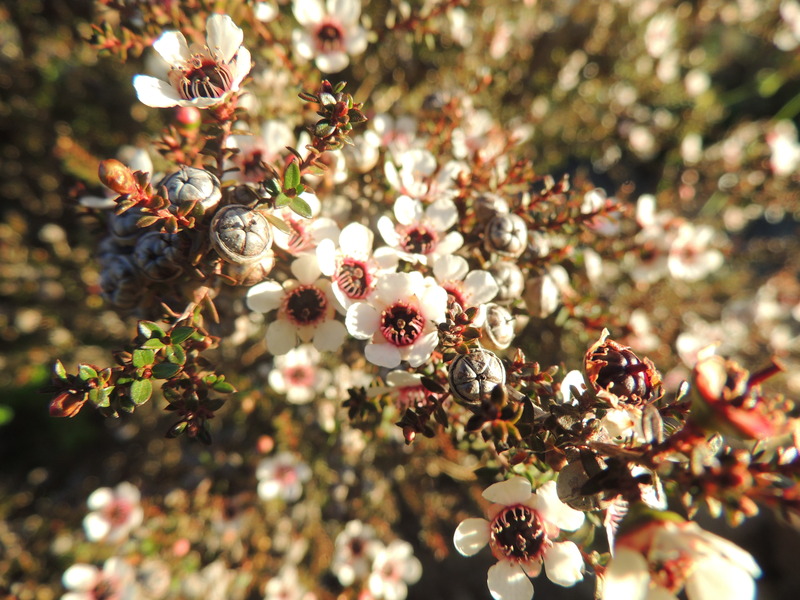 Here is Leptospermum scoparium 'Kea' which started flowering in May, and is still going strong. Top marks for perseverance, don't you think? 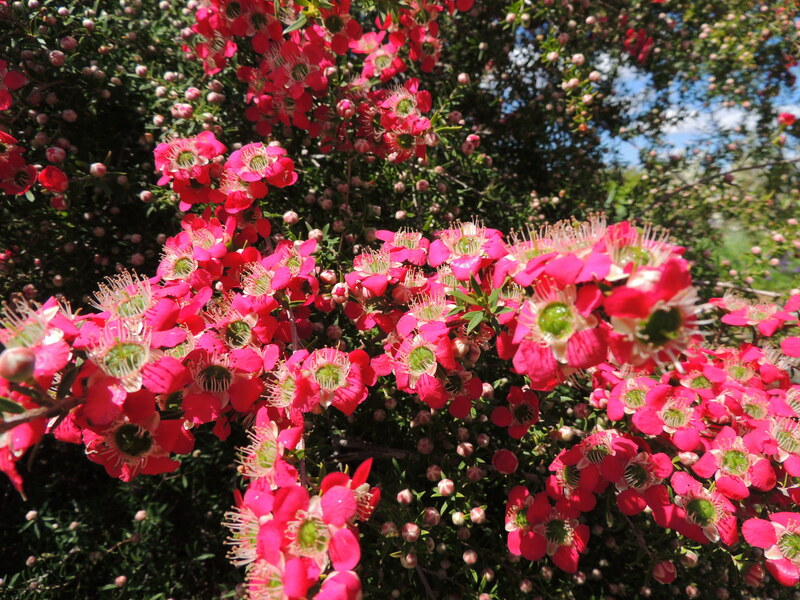 The petals on this Leptospermum are the palest of pinks contrasting with crimson centres. Its seed cases are shaped like miniature buns and are very hard. Like so many plants native to Australia, the seed cases open better when subjected to fire. 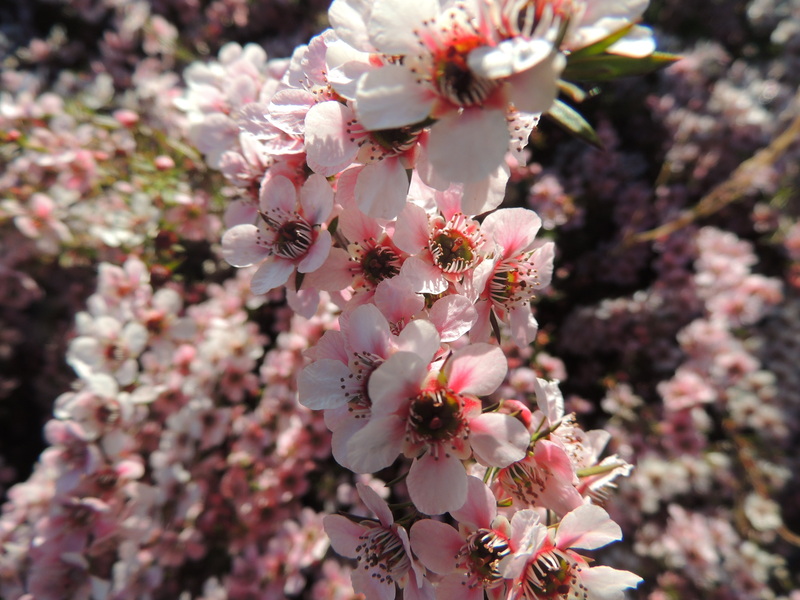 Leptospermum scoparium 'Pink Cascade' is a frothy concoction of exuberant pinkness, its flowers floating along the branches like the corps de ballet gliding out of the wings across a stage. 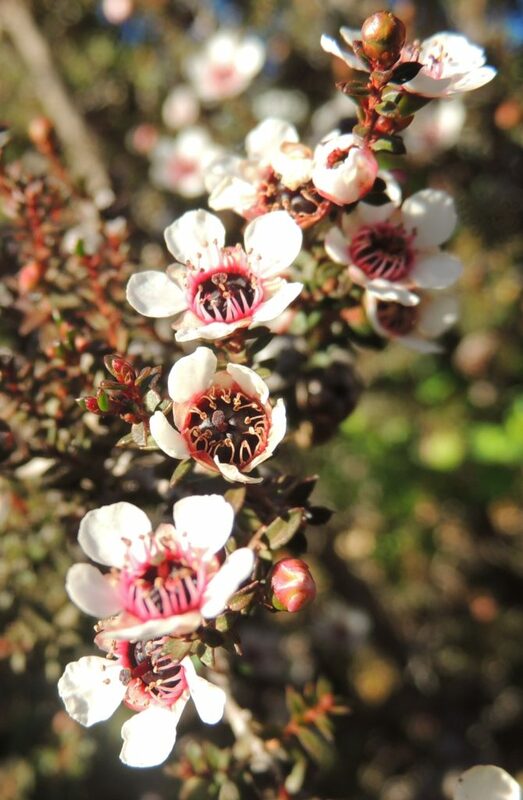 Leptospermum scoparium 'Nanum Rubrum' has burgundy coloured leaves and scarlet flowers with almost black centres. Its flowers cover the plant like barnacles clinging to a ship's hull. 'Outrageous' is flowering, well, outrageously! What a lot of pinkness there is in all of this: this time a darker pink with an almost lime green centre and white anthers. And there you have them. My Leptospermums, providing a bit of excitement in the garden for a few weeks. Native to Australia and New Zealand, their common name is Tea Tree (in New Zealand, mānuka as well) and they are called this because early settlers used their leaves for making tea. In New Zealand, the mānuka tree provides world famous honey which is believed to have healing properties, and indeed, my late father-in-law used it to successfully treat an ulcer on his leg. On a final note: the drought which has been holding NSW in its iron fist is not over even though there has been some good rain. Being such a huge area, there are many parts that didn't benefit from the rain, and dams are still not full, so we are hoping for what is called 'follow-up rain' which the Bureau of Meteorology informs us is not terribly likely. Previous Post Saturday Splendours, SoS Oct 13. I don’t think I’ve actually seen those flowers before. Absolutely gorgeous. Thank you Coral. They certainly are eye-catching. Jane, your garden is delightfully pretty in every shade of pink. The bees must be very happy. Ever thought of keeping bees as well? We did have a hive, Tracy, but I found I wasn’t quite as brave about opening it as I thought I would be. As well as that, MrMG is allergic to bee stings so it seemed like not such a good idea to have a hive after all. We gave it to a bee keeping friend. I’m not brave either, Jane. Oooh, the ‘Lavender Queen’ looks very pretty. Maybe I should get one of those…a bit of relief from all that pink! Jane, these pictures are just wonderful! 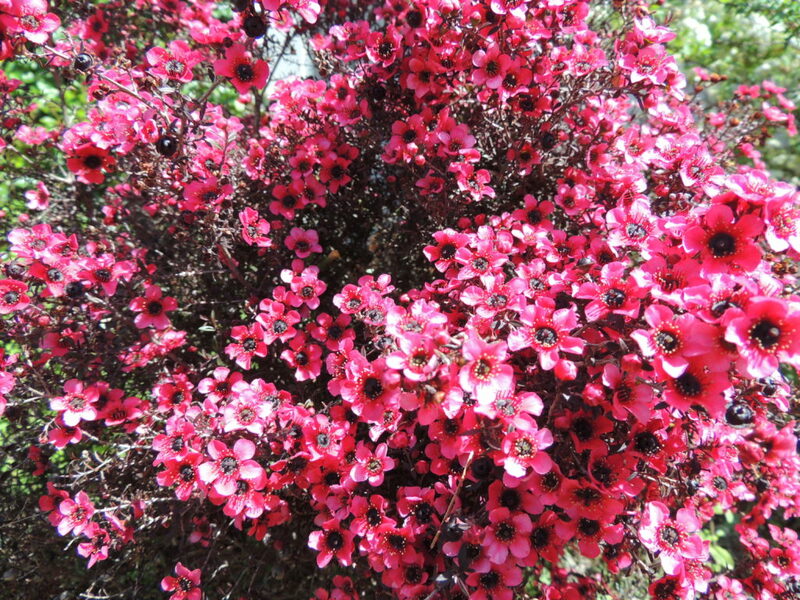 I don’t have Leptospermum in my garden but they are in bloom in other gardens and streets here, they are so beautiful. Happy week and gardening! They would make attractive street plantings, Marcelo. Happy gardening to you too…you’ll be busy with all your roses. Wow, they are stunning. What an incredible show. I have tried to grow them but they always die here. I wonder why that happens Chloris? Perhaps too damp? It’s strange, because they’re actually very hardy plants. “It is wind chill rather than frost which can often kill leptospermums outside milder western counties. Sloping ground which does not freeze is another plus. Waterlogged wet areas are a disaster.” Maybe try growing them in a container? I might have a go at one – they are very pretty. Very, very pretty. I’ve never heard of or seen these flowers before. Hello Cindy, thanks for your comment. Keep an eye open-I’m sure you’d be able to get them over there. They’re stunning, but I have to say Pink Cascade is my favourite. I love the softer colour. I don’t think I’ve ever seen such a mass of flowers – must be the Mudgee area that suits them so well. 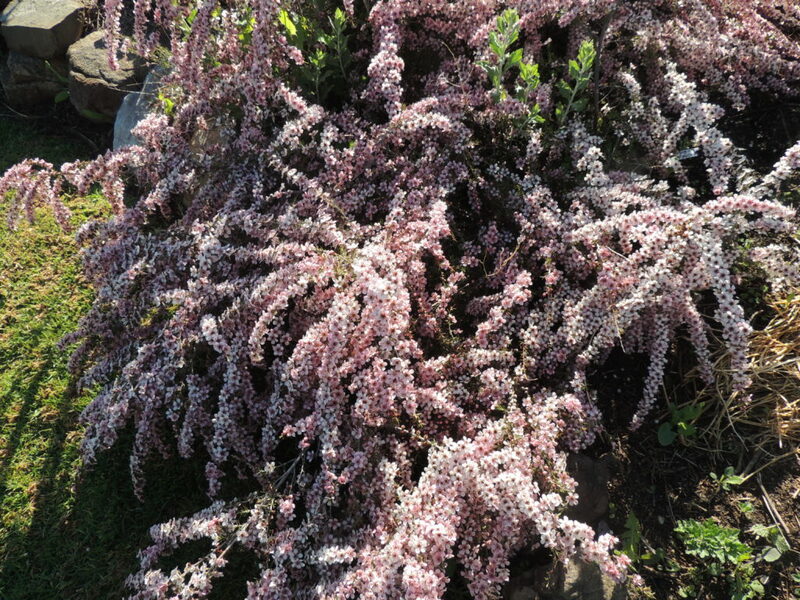 Pink Cascade probably has the greatest number of flowers- it’s most appropriately named. Some Springs are better than others, and maybe this year’s Spring is perfect for these plants. I can’t think of any other reason for this proliferation of flowers. Gorgeous! I haven’t seen them looking like this anywhere else! They’re such easy plants, Jane..put them in and wait for the display! Beautiful and lush! I’m not familiar with that, but I can certainly see why you’d want it in your garden. 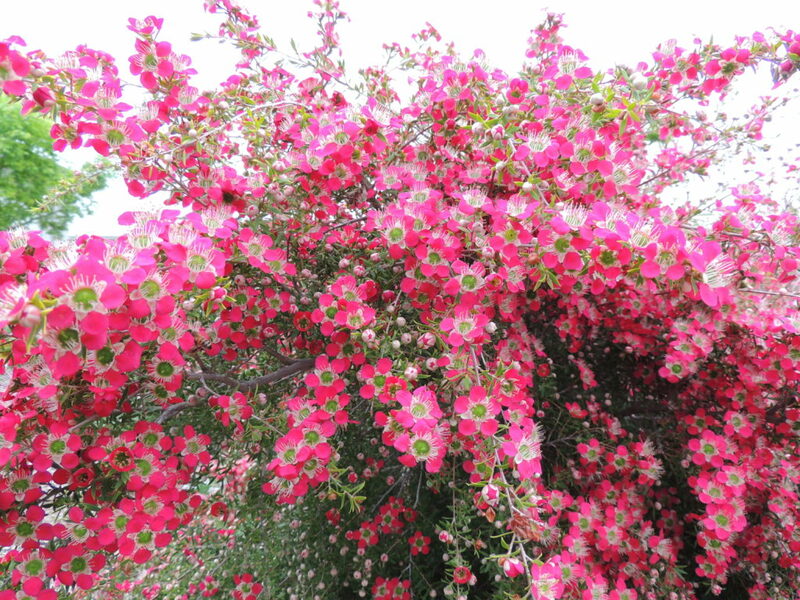 Oh, my, your Leptospermum are beautiful. I gasped at the first one, but then each one that followed was even better. The last one is perfect! We can apparently grow them in Cornwall, but I’m not sure my garden is suitable as it is very windy and they like shelter. “Nicholsii” is recommended as it is quite hardy and I quite fancey “Red Damask”. The last one is my favourite too, Jude, as it’s a bit different with the green centre. I looked at your favourites online, and liked ‘Red Damask’ as it has double flowers. Very fetching. Beautiful pictures! They are certainly thriving in your garden, and a lovely variety of colours. I guess as with every dry region when the rain falls the plants lap it up and bloom like crazy while the going’s good. They are certainly blooming like crazy for you. What an incredible display! I’m sure you’re right about that, Jessica, everything seems to be making the most of it. I fear we’ll be worrying about lack of rain before too long. Beautiful tea trees. I have never seen them before. I hope you get plenty more rain to keep everything in glorious bloom. Oh thanks, Cathy, for your good wishes. I think the roses must have known they would be outshone by this glorious display and are waiting their turn. I love seeing tea trees in full bloom and yours are lovely. The rain was great but, like you, we need more and some areas got none. It’s amazing though how quickly everything turns green again. I think it’s what is called a green drought, Carol. Thanks for your comment. 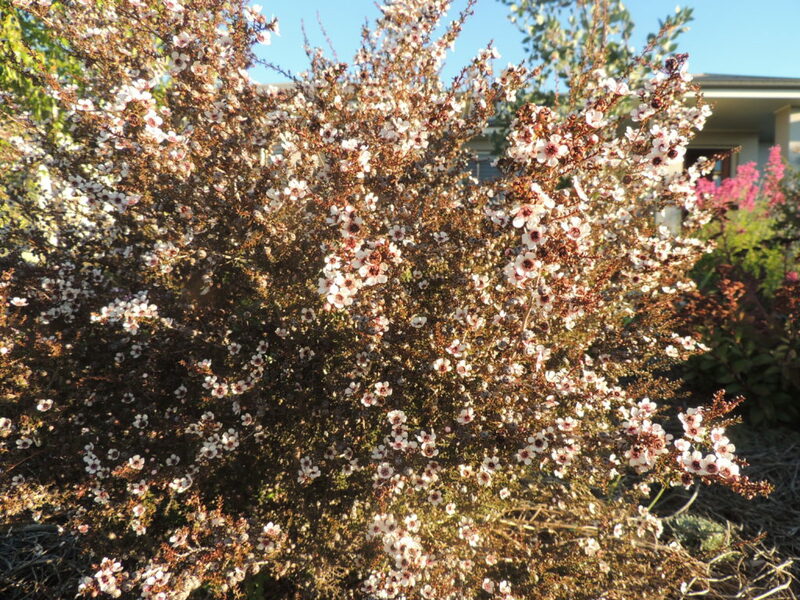 My Leptospermum scoparium generally have 2 seasons of bloom but neither comes near to matching the splendid display yours have produced. I’m glad you’re celebrating it. I love ‘Outrageous’, which I’ve never seen here. I hope you get still more rain and that we get something of the same luck this coming winter. Thank you Kris, and I do hope your rain outlook improves too. ‘Outrageous ‘ is my favourite too. A brilliant display of different pinks and reds. We have lots of bees humming around. We are sometimes concerned our dog Milo might get stung. He ignores the bees totally just keeping an eye out fro black crows. A brilliant display of pinks and reds. We have lots of bees around. We have had the best display of Clivias this year, despite the frost. This is a wonderful post and what a glorious display of different pinks and reds. I bet the bees are busy! Thanks so much Lis. It’s lovely to hear from you. I like ‘Outrageous’ best too! It’s a bit different from the others and certainly has an abundance of flowers. These tea trees are cultivars- they’re not quite so exciting in the wild. One of my favourite flowering bushes. The shape of each flower is exquisite and yours are magnificent. One of my favourites too! Thank you John. Such easy plants, Gill, and yes, ‘Outrageous’ is perhaps the most spectacular. So many gorgeous Leptospermums I’ve never even heard about! I would be hard pressed to pick a favorite, but either of the last two are pretty spectacular. I do hope that the Bureau of Meteorology are wrong, and that you get some more of that life-bringing wet stuff. Fingers crossed! I was so looking forward to them flowering, Anna, and they didn’t disappoint. Thank you for your rain wishes, too, we can only hope. I am enjoying it so much Alys. Each day there is something new to admire. Thank you for your comment. Leptospermums grow here, but they don’t look like yours! ‘Outrageous’ looks like a species rose, it is lovely. I hope you get more rain! 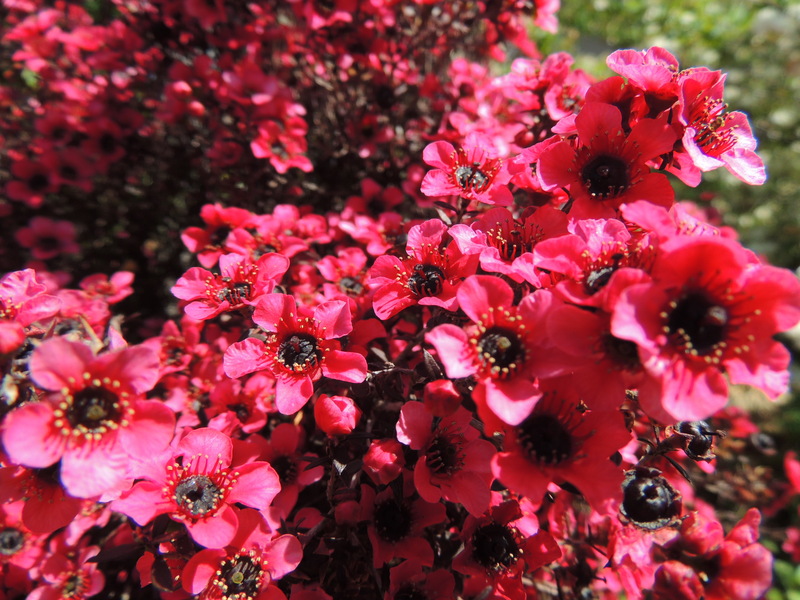 Thank you so much, hb, ‘Outrageous’ has been the most admired Leptospermum.Thanks for the rain wishes too!